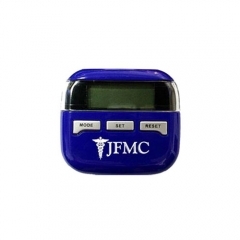 Bring an eco friendly concept in your brand promotion through the custom solar power cosmic pedometer. It helps your customers to record their physical activities in light and dark. 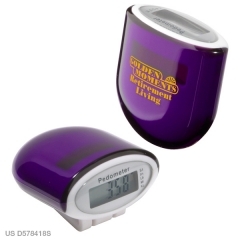 The promotional solar power cosmic pedometer measures 1-9/16” x 1-3/4” x 1-1/8”. It can count the number of steps up to 99,999 as well as the distance travelled and the energy used in calories. All these results will be displayed on the solar panel with LCD display screen. Your customers will surely thank you for giving such a device that they can use in day and dark. There is a back up battery for low light conditions too. When you gift your well wishers and your customers with such brand imprinted personalized solar power cosmic pedometer, they will surely use it before others while jogging or working out. 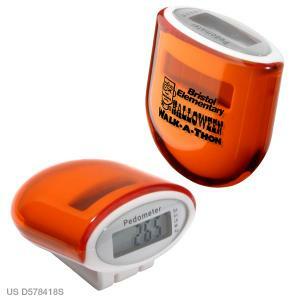 Such an attractive orange pedometer never goes unnoticed neither do the brand imprint on it. So a custom solar power cosmic pedometer is ideal to promote your brand name in the market.